Product: 415ml/14oz Strong White Disposable Plastic Bowls With Silver Marble Effect - Pack of 10 was added to cart. 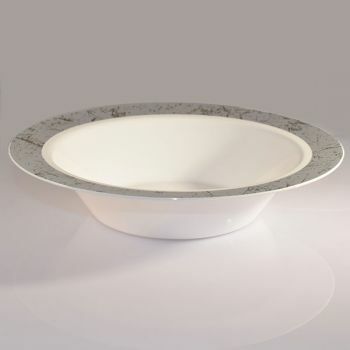 From Masher’s best-selling Silver Marble Effect Disposable Tableware Collection, these White Plastic Dessert / Soup Party Bowls will add a touch of class to your celebration. Made from tough food-grade plastic, they are washable, reusable, and designed to coordinate beautifully with the matching disposable dinner plates and side plates in this exclusive range. A popular choice for weddings, receptions, corporate events, and birthday parties, these throwaway plastic party bowls will serve your starters, salads, desserts, soups, and sauces in style.